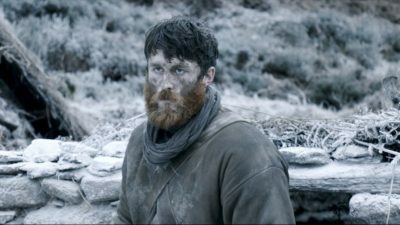 Last Wednesday I attended a preview for a forthcoming Irish film, Black 47 (Director Lance Daly), about the worst year of the catastrophic Irish famine and is set in the west of Ireland in 1847. The story centers around an Irish soldier, Feeney (James Frecheville), returning from serving the British Army in Afghanistan only to find most of his family have perished in the Famine or An Gorta Mor (the Great Hunger) as it is known in Gaelic. The English and Irish terms for Ireland’s greatest tragedy are infused with different ideological approaches to the disaster. By emphasising the failure of the potato crop only, the impression is given that there was no food to be had on the island when the opposite was true – there were many other crops which did not fail but were not accessible to the vast majority of the people – hence, the Great Hunger. In Black 47, the colonised fight back as Feeney puts the skills he has learned abroad with the British army to effective use in Ireland. He kills or executes the various people involved in the British colonial system he blames for the starvation and death of his family: from the bailiff to the judge to the colonial landlord. Moreover, Feeney goes a step further as he refuses to speak English to those in power before he kills them, reflecting back to them an immediate understanding of the powerlessness of those without the linguistic tools to negotiate compromises (as was seen in the film when a monolingual Irish speaker gets tough justice for ‘refusing’ to speak English in court). Back in the late 1980s a book entitled ‘The Empire Writes Back: Theory and Practice in Post-Colonial Literatures‘  showed how the language and literature of the empire, English, was used by colonised peoples in the creation of a radical culture to aid their resistance to the hegemony of imperial power. However, now with many of his family dead, Feeney has ceased to be a Caliban profiting on the language of his masters and becomes a powerfully drawn hero who is uncompromising in his insistence that the Irish language and culture will be a respected equal to the imposed English language and culture of the colonists. In the film the ruling class and their hierarchy of supporters are flush with food and the army is used to transport harvested crops to the coast and exportation. This fact is displayed symbolically when one of Feeney’s victims is literally ‘drowned’ in food, as he is found head first in a sack of wheat. The international aspect of the Black 47 narrative hints at the geopolitics of the day with Feeney’s return from Afghanistan and the concurrent mass emigration to the United States from Ireland. Feeney’s indignation at finding out how his masters have treated his own family and compatriots as he risked his life for them abroad is similar to the treatment of the African-American soldiers of the Vietnam war on their return to the United States. But this is not a black and white, Irish versus the Brits, movie. There is complexity as some of the British show empathy for the desperate Irish and pay the ultimate price or go on the run. The closure of ports was a traditional, short-term response to food shortages. It had been used to great effect during the subsistence crisis of 1782-4 when, despite the opposition of the grain merchants, ports had been closed and bounties offered to merchants who imported food to the country. During the subsistence crisis of 1799-1800, the government had placed a temporary embargo on the export of potatoes from Ireland. In 1816 and 1821, the British government had organised the shipment of grain into areas in the west of Ireland where there were food shortages. The grain was then sold on at low prices. Similar intervention and market regulation occurred in Britain. Unfortunately for Ireland, Sir Charles Edward Trevelyan (2 April 1807 – 19 June 1886), a British civil servant and colonial administrator, was put in charge of administering famine relief. Trevelyan was a student of the economist Thomas Malthus and a believer in laissez faire economics and the free hand of the market. Trevelyan described the famine as an “effective mechanism for reducing surplus population” as well as “the judgement of God”. In 1847 alone, the worst year of the Famine, almost 4,000 vessels carried food from Ireland to the major ports of Britain, that is, Bristol, Glasgow, Liverpool and London. Over half of these ships went to Liverpool, the main port both for emigration and for cargo. Ultimately, one million people starved to death and one million emigrated reducing the population by about 20% – 25%. Black 47 is an uncompromising film that depicts the harrowing results of a crop failure combined with an ultra exploitative system that knew no moral or legal boundaries. Sure, attempts were made by well-meaning people to alleviate the crisis but the failure of the state to end the crisis on a macro level resulted in an unprecedented disaster for the Irish people. It will go on general release in September. 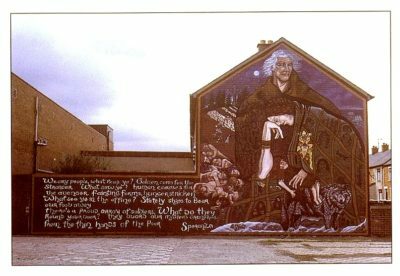 For those interested in finding out more about the Great Hunger, here is a select list of material covering different aspects. The preview showing of Black 47 was to complement a concurrent exhibtion of art in Dublin Castle showing at the Coach House Gallery until June 30. The exhibition, titled ‘Coming Home: Art and the Great Hunger‘, is an exhibition of the world’s largest collection of Famine-related art. Atlas of the Great Irish Famine edited by J. Crowley, W. J. Smith and M.Murphy. 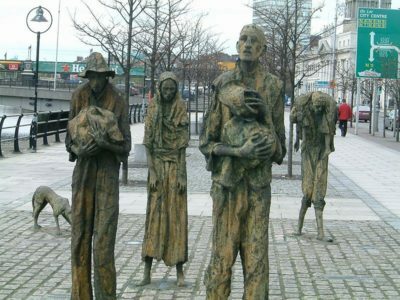 The National Famine Commemoration Committee was first established in 2008 following a Government decision to commemorate the Great Irish Famine with an annual national famine memorial day. Caoimhghin Ó Croidheáin is an Irish artist, lecturer and writer. His artwork consists of paintings based on contemporary geopolitical themes as well as Irish history and cityscapes of Dublin. His blog of critical writing based on cinema, art and politics along with research on a database of Realist and Social Realist art from around the world can be viewed country by country at http://gaelart.blogspot.ie/. Read other articles by Caoimhghin. This article was posted on Friday, April 13th, 2018 at 11:53am and is filed under Famine, Film Review, Immigration/Immigrants, Ireland, United Kingdom.